We've written in the past about the EFF's Who Has Your Back rankings, in which it looks at various internet companies to see who protects your privacy against governments and lawsuits. 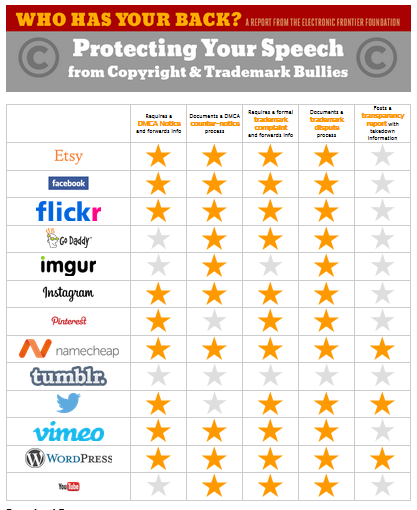 Now, the EFF has come out with an offshoot chart, looking at who has your back when it comes to bogus copyright and trademark demands. The only two companies that get a perfect score are Automattic/WordPress and NameCheap, as you can see on the full chart. The worst, somewhat surprisingly, is Tumblr, which scored a big fat zero out of the five listed items. Twitter lost a point for not documenting the counternotice process. Etsy lost a point for failing to have a transparency report (something I'm guessing the company will do before too long). Facebook also doesn't have a transparency report -- though it does have one for government requests, so hopefully it will expand that to copyright and trademark takedown requests as well. YouTube lost points for not requiring a DMCA notice (thank you ContentID) before taking down content. Imgur also doesn't require a DMCA notice (which surprised me). The EFF's original "Who Has Your Back" effort really did help shame many companies into upping their game in protecting the privacy of users from government requests. Hopefully this new one will do the same for copyright and trademark takedowns. Tumblr is one surprise for me there even though I should have seen it coming from past news. As a bit of a suggestion I'd expand this list with many other services. Still it's a nice initiative from EFF. Kudos for them! Good work and all but for REAL balls, check out iiNet in Australia which has gone to the High Court once and likely to do so again, in defence of its customers. Credit where credit is due. They deserve a big wrap for what they are doing here. They've been mentioned several times on TD already, with the latest not too long ago if memory serves. Please use smaller images, I can still make out a few words in that one. Easy DNS should be another stand out firm for their rights with the city of London's Police PIPCU. I'm pretty amazed that imgur is a two star slacker , guess they don't put much value in their user base. Not surprising that the Intelligence community chooses to use the option with the lowest score.